Word of Mouth Marketing High Five! 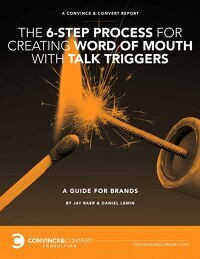 Thanks for your interest in “The 6-Step Process for Creating Word of Mouth with Talk Triggers”. My new book Talk Triggers (available on Amazon pre-order here) is coming out this Fall. Talk Triggers is the definitive, practical guide on how to use bold operational differentiators to create customer conversations. Pre-order it now. Let’s work together to ignite word of mouth about your company. Take a look at how we help some of the largest companies in the world with their word of mouth marketing strategy. If you think it makes sense to chat now, please let us know. We can’t wait to get to know you!